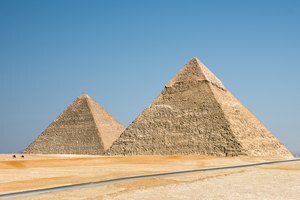 What Three Types of Tombs Were Used in Ancient Egypt? The pyramids have chambers once filled with treasures for use in the afterlife. 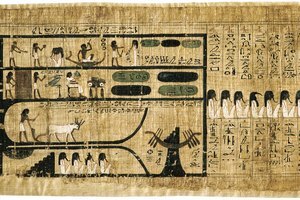 Ancient Egyptians believed in an afterlife, and wealthy people assembled items for the same luxurious second life that they experienced in the first. 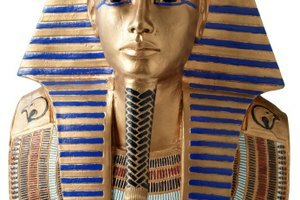 Pharaohs ordered builders to construct elaborate burial chambers stocked with food, furniture and favorite items, including pets for comfort and servants to work in the afterlife -- all executed to join the leader in the hereafter. Treasures buried with the ancient Egyptian kings included valuables owned during life, and new items made to demonstrate high social and political position. Some rulers included items for travel, including gold and silver boats for the death journey. Egyptologists in 1922 excavated the tomb of King Tutankhamun, who was buried in 1323 B.C. 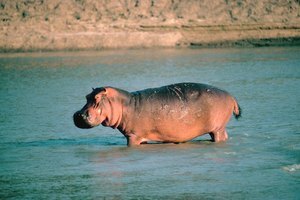 The team discovered more than 2,000 treasures, including a throne decorated with precious stones and silver, gold coffins, gold-plated chariots and alabaster vases. "King Tut" was just one of the many pharaohs buried in the region known as the Valley of the Kings, an area of dual desert canyons on the Nile River's west bank. The valley contains 62 tombs of important rulers and nobles, many undocumented by archaeologists. Even in ancient times, tomb robbers emptied the tombs of valuable contents, and the original contents of most tombs remain unknown due to the plundering. Some hidden chambers within tombs, however, escaped major looting for centuries. Surviving inventories left in some tombs help archaeologists make educated guesses about the contents of other tombs based on the length of the pharaoh's rule and the wealth of the kingdom at the time. Tombs of the Egyptian pharaohs contained multiple chambers and each held different treasures. Mummies frequently were adorned with gold masks and body coverings. 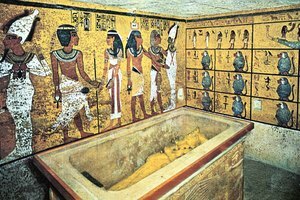 Amulets and jewelry made from gold, silver and precious stones were ritually placed in the linen wrappings during mummification. Researchers found more than 200 pieces of jewelry, for example, tucked into Tutankhamun's body wrappings during excavations in 1923. The special treasury rooms in large tombs held chests of jewelry and precious metals. Jewelry of Egyptian rulers typically featured gold and colored stones, which were reserved for religious and political leaders only. Jewelry and statuary used religious themes since pharaohs were thought to be direct descendants of the gods in ancient Egypt. 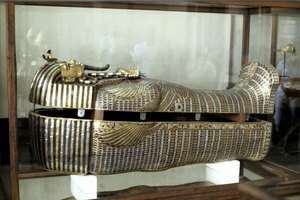 Egyptologists Hans Wolfgang Muller and Eberhard Theim list tomb items such as beds and chariots made from gold and silver to demonstrate the leader's high status to people in the afterlife. Artwork and jewelry also featured images of the religion practiced during the ruling dynasty, but representations of the the sun god Re or Ra (a solar disc) and Horus (a falcon) frequently appear on jewelry and statues from tombs of all dynasties. Smithsonian Magazine: King Tut -- The Pharaoh Returns! Grayson, Lee. "What Treasures Might Be Buried With the Ancient Egyptian Kings?" 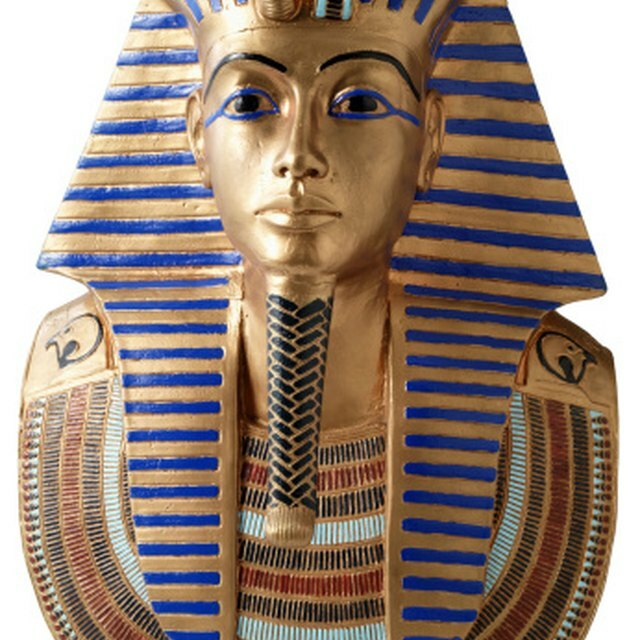 Synonym, https://classroom.synonym.com/treasures-might-buried-ancient-egyptian-kings-12073.html. Accessed 20 April 2019.